where the wild things are no.14. stinging nettle and mint tea. This morning we made a fresh stinging nettle and mint tea. A fresh tea or a tisane is really easy to make. A tisane is a herbal or plant infusion made from the leaves, fruits or roots of a plant other than a traditional tea bush. When we were in Sweden last summer we had a different tea every morning at the restaurant Faviken Magasinet. Herbal infusions like this one can be served either hot or cold. One of our favorites at Faviken was a cold juniper infusion. As with any wild plant, make sure you properly identify it before eating it. Nettles are available this time of the year at greenmarkets or in the wild. They are definitely available at the Union square Greenmarket here in New York. If you choose to harvest them yourself, wear gloves and long sleeves and pants! Always make sure you are harvesting from a pesticide free area. Set tea water to boil. 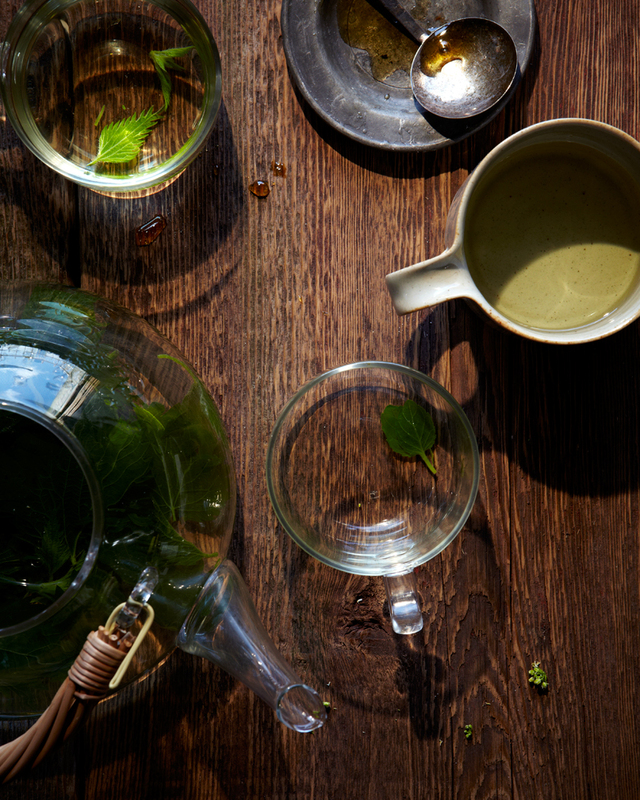 Place the mint and nettles in your teapot. You can chop the nettles and the mint if you wish or use them in their whole form. When the water is boiling, pour over the nettles and mint leaves and leave to steep for 8 to 10 minutes. The boiling water and the steep time erradicate the sting in the stinging nettles, so be sure to leave it to steep for the entire time! The tea will take on a beautiful soft green color and subtle grassy woody flavor. Drink it straight or add a little milk and honey.